Lot 13. 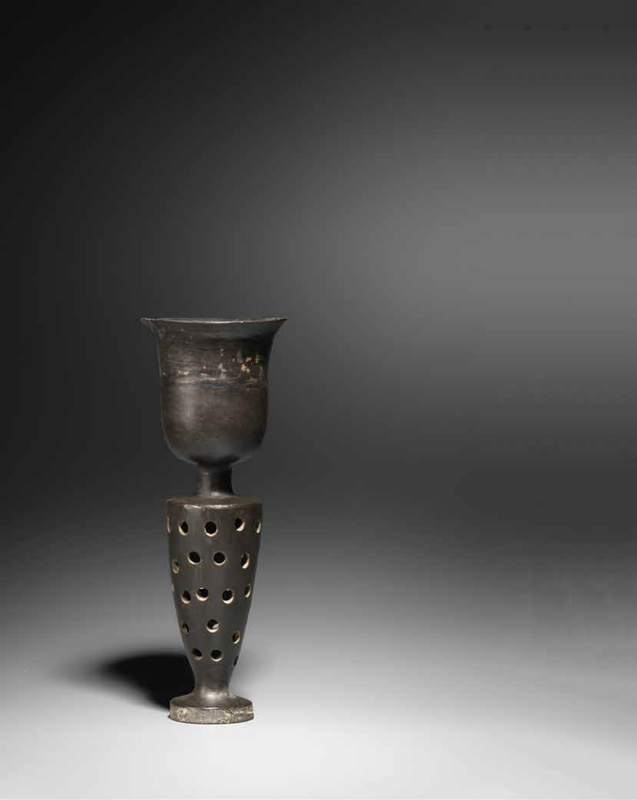 A rare black pottery stemcup, Neolithic Period, Longshan Culture (c. 3000-1900 BC); 20cm (8in) high. Estimate £10,000 - 15,000. Sold for £ 6,250 (€ 7,170). © Bonhams. The thinly potted vessel with an angular bell-shaped cup ending in a trumpet mouth and raised on a hollow tear-drop-shaped stem pierced with vertical rows of small holes rising from a pedestal foot defined by slightly spreading upright sides. Note: The present lot is a rare example of a wheel-made pottery vessel of the Longshan culture, also sometimes known as the Black Pottery Culture. 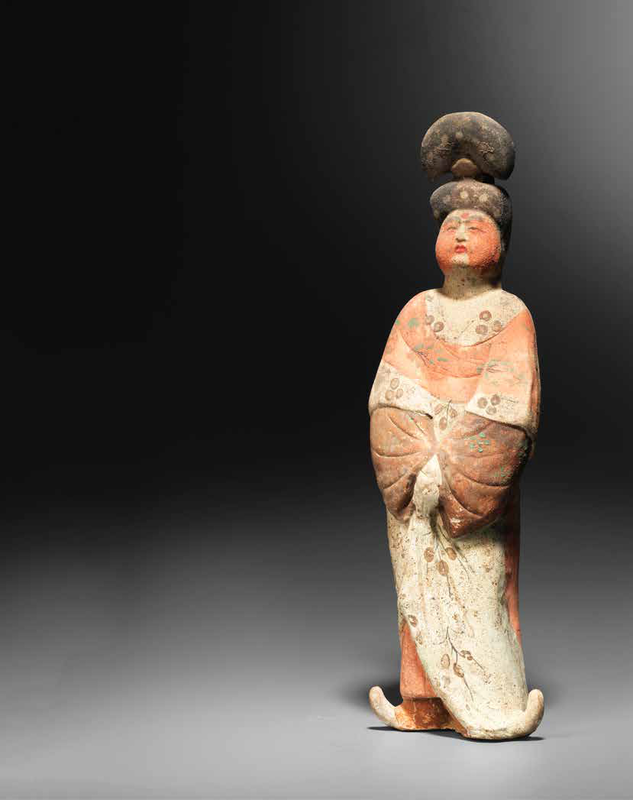 Spread across today's Shandong Province from about 3000 to 1900 BC, the Longshan culture was noted for its highly polished 'egg-shell' black pottery. The present stemcup is notable for its even potting, paper-thin walls and glossy black sheen. Examples of related black 'eggshell' pottery stemcups are illustrated by R.Krahl, Chinese Ceramics from the Meiyintang Collection, vol.3 (I), London, 2006, pls.1058-1063. Krahl noted that the use of the potter's wheel was a technological innovation of the period and enabled more sophisticated forming than the coil-built method traditionally used. With the new technology of the potter's wheel, eggshell-thin vessels could be made by shaving the walls to minimal thickness. In addition to this, the appearance of weightlessness was created by the addition of pierced openwork. 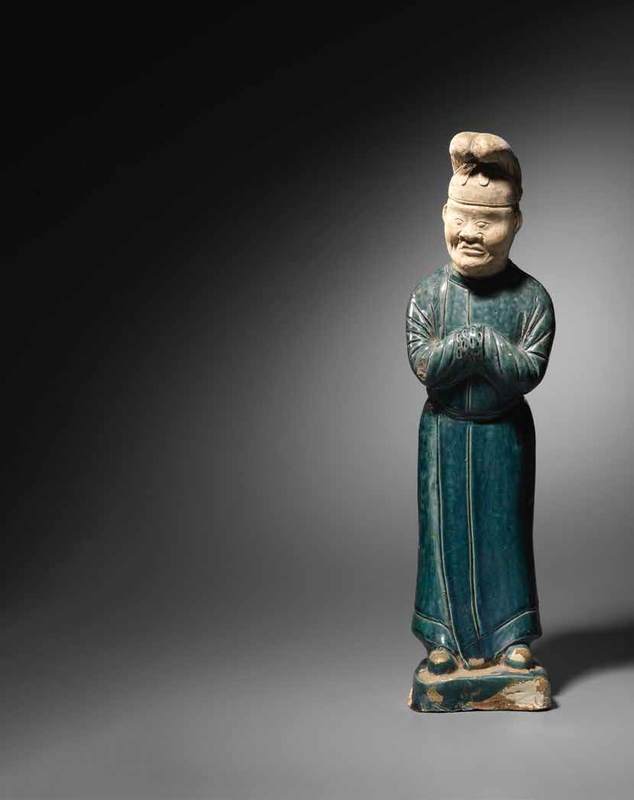 Compare with two related examples in the same style with different lower bodies, which were sold at Christie's New York, 2 June 1994, lot 228 and 21 September 1995, lot 580.